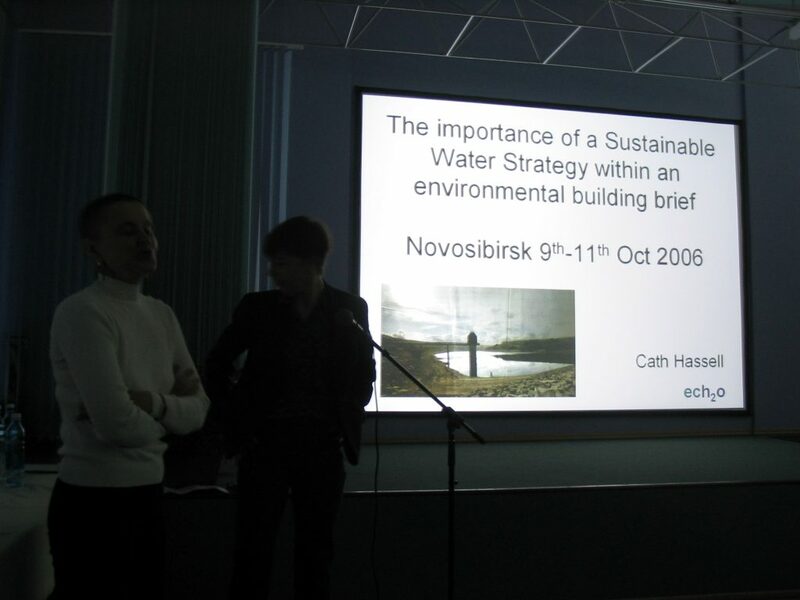 I was there on an environmental building cultural exchange visit and talking at a conference – complete with translator. And a rather prosaic presentation title with random capitalisation to boot! 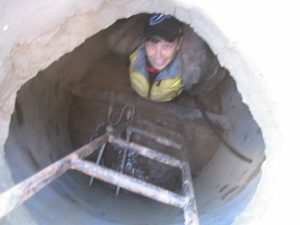 It was also way before I even began to think about this blog and therefore while I did have several showers there – five day stay so five showers – I can’t actually remember anything about them! Except for the fact that shorter showers (and in fact any kind of water efficiency) was pretty well off the radar for most people. Hence the conference, the first of its kind in Siberia. 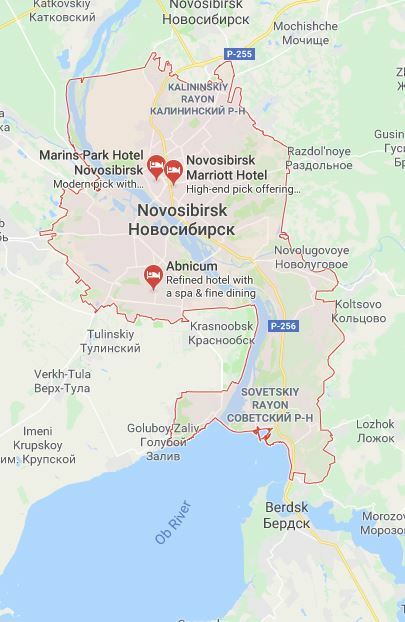 To be fair, Novosibirsk and Siberia as a whole don’t suffer from water shortages. Whilst average rainfall is only 425mm, so just two thirds of London, Siberia covers a massive area and the population is sparse. Available water per head of population in the Siberian and far-east river basins of Russia is 120,000-190,000 m3 per inhabitant compared to 2,000 – 3,000 m3 west of the Urals. 80% of the total population lives in the European part of Russia, but it has just 8% of the total river runoff (360 km3 of surface water resources) and 10% of the total renewable annual groundwater resources (23 km3 of groundwater resources) The huge distances between the Siberian and European basins make it practically impossible to transfer water from Siberia to the European part of Russia and although transfer projects were considered in the past issues such as cost, potential terrorism and environmental concerns ruled such schemes out. 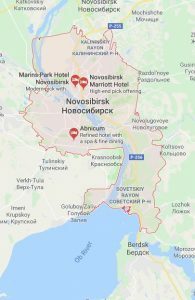 Novosibirsk’s water supply come from a reservoir on the outskirts of the city which is the result of damming the Ob River for hydro-electric power. 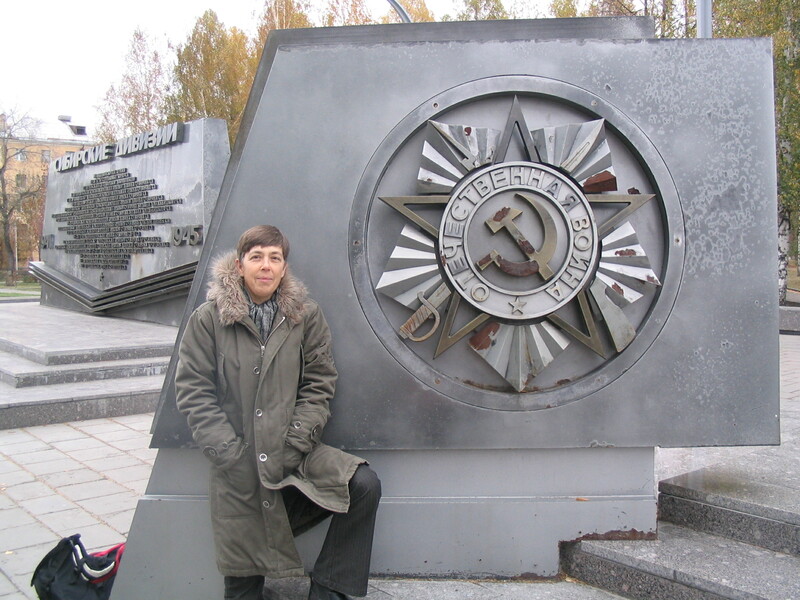 According to one woman I met at the conference, when they damned the river it changed the weather in Novosibirsk. Whilst that might seem like an urban myth, research in China has proved that the Three Gorges Dam has increased rainfall in the valley area the reservoir now occupies, and so it is certainly possible. What I do remember very clearly is how hot and cold water is supplied to buildings. First up is the incoming mains supply. As a plumber in the UK I’m used to finding the mains supply at about 450mm deep; here it was over 2 metres! (As demonstrated by me, left.) Pipes must be laid lower than the depth to which the ground will freeze to ensure the water supply keeps flowing all year round. 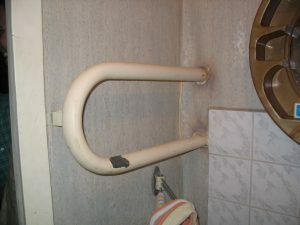 With average winter temperatures in Novosibirsk of minus 20 °C to minus 12 °C no wonder the pipe needs to be so low! And hot water supplies? Well most hot water to flats is produced centrally and massive pipes, many of them above ground, distribute water at temperatures up to 120 degrees C around the city. This can create spectacular leaks if the pipes burst as demonstrated in this video! 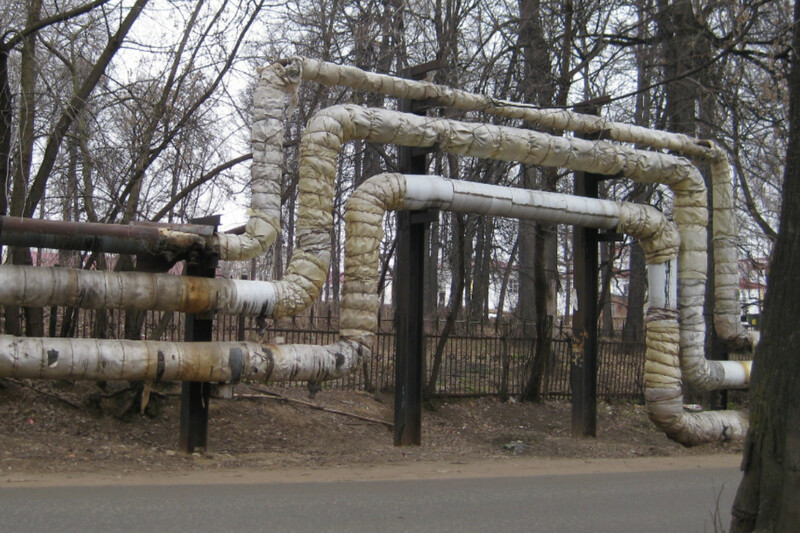 And this photo of his shows part of a hot water distribution network at a point where it has to account for expansion of the pipes themselves. 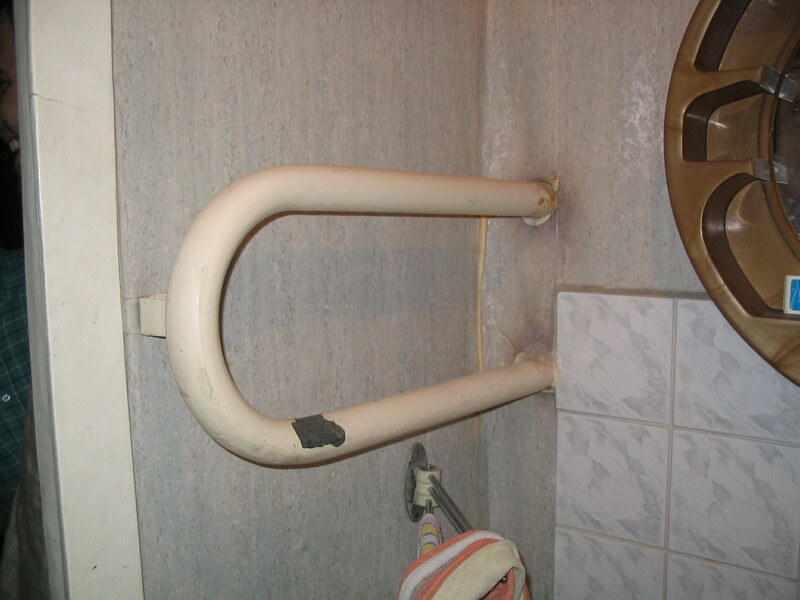 Once the hot water supply reaches the apartment blocks pipes snake their way around individual flats to provide heating as well as hot water – the latter via a heat exchanger. Why such little inclination to reduce water use? Well, as stated earlier, people are aware that Siberia does not have a water shortage problem. And while total water withdrawal has been falling in Russia since the 1980s (from 97.8 km3 in 1982, to 77.1 km3 in 1994 to 66.2 km3 in 2001 and 61 km3 in 2013) the reduction in water consumption has been in the industrial and irrigation sectors and related to the difficult economic situation in the Russian Federation. Rental charges in flats (where most people live) cover all utilities including heating and hot water and in most flats there are no internal controls to turn supplies on or off. Since most hot water is a by-product of the power generation actually it would go to waste if wasn’t used so until there is a large reduction in electricity demand there is unlikely to be a reduction in the available hot water. All of which means that the four minute shower timer, so loved by UK water suppliers, is unlikely to make an appearance in Siberia anytime soon. ← Frankie has a new mystery to solve!